All projects created with Storyboard Pro are independent and local to the computer. There are a few different ways to create and open projects. You can create a project from the Welcome screen, File menu, Final Draft script, or Toon Boom Harmony scenes. A Storyboard Pro project is composed of several files. The drawings and colour palettes are not embedded in the project. They are separate linked files. Therefore, if you want to archive or share a project, you require all the files contained in the folder structure. Here is an example of the file structure contained in a scene. As you work and use more features, different folders may appear in your structure. 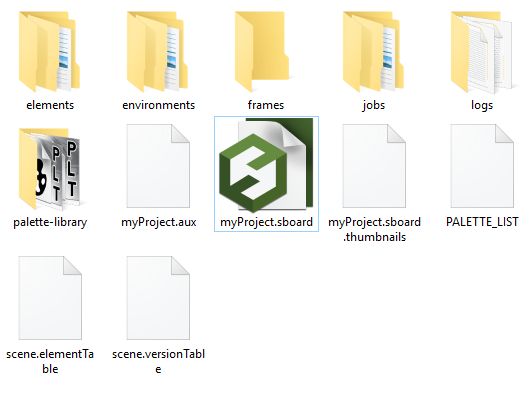 The Storyboard Pro project folder contains the following folders: frames, audio, elements, etc. audio Contains all imported audio files. Contains all the drawing files. Contains the exported palette files that were originally stored at the environment level in the Harmony Server database structure or the palettes in a Harmony Stand Alone scene that will be imported later at the environment level in Harmony Server. This is for compatibility with export to Toon Boom. Contains the final frames after a render if you are using the default settings of the Write node in the Node view. logs Contains traces of operations and processes while working with Storyboard Pro. This can be useful for debugging. This is the main Storyboard Pro file. This is the file you must click on to launch the software and load the project. This file links to all the other files in the directory. PALETTE_LIST This is the list of all the different palettes in the project.